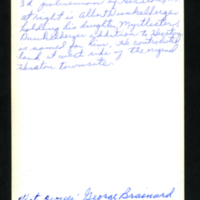 "Around March 1, 1922, the city employed Ira Brainard as city marshall primarily to serve as night watchman. At $40 per month, Ira did not get wealthy. The report also showed expenditures of $5 per month for "coal for the marshall." During winter months, the marshall probably warmed himself at a stove in the city building" (Bandy, 74). "Ira Brainard was a colorful personality and certainly well liked. Young men often teased him. King Motor Company employed a young man named Lawrence Yoder nicknamed "Stogie" because he smoked a cigar while at the academy. One July 4th, some one tied a pack of small firecrackers to a cat's tail, and the poor creature almost ran itself to death. While in the restaurant, Ira said that if he learned who did it, he would arrest him. One young man said the culprit was Lawrence Yoder. Brainard knew Lawrence only as "Stogie" Yoder, so he inquired where this "Lawrence" Yoder could be found. He heard Yoder was at King's. Brainard walked into King's and said, "Hello Stogie! Have you seen Lawrence Yoder? He's under arrest." Yoder said he had not seen Lawrence Yoder. In the shop at the rear of King's, Brainard was told Lawrence was up front. Needless to say, Brainard never found "Lawrence" Yoder, and it was equally true that Yoder had not put the fireworks on the cat's tail" (Bandy, 74). 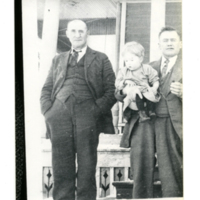 unknown, “Ira Brainard, Hesston policeman,” Hesston Public Library, accessed April 19, 2019, https://hesston.digitalsckls.info/item/1354.